^^Tellingly for 1983, it does not appear as if Karen's passing produced much of a "spike" in sales. The Singles 1969-1973, at #134 on March 26th, 1983, is not particularly impressive for USA sales. Many thanks, GaryAlan. That was my recollection: radio stations played a few of the biggest hits from the early years the day or so following Karen’s death, and that was pretty much it. I also recall the ghastly People magazine cover (followed by the cynical, cash-in, "part 2” cover issue that followed...), a few “Entertainment Tonight” stories, an American Music Awards tribute, and a few, local Carpenters tribute specials on AC radio that year. Not a lot of recognition of her impact immediately following; it seems like Karen’s legacy has slowly built momentum over the following decades. Thanks again. At the radio station I worked for, at the time Karen's death was announced, we weren't playing any Carpenters records at all. In 1983, they were a relic of the past and didn't fit with the move-forward attitude of the '80s. I wandered back to our Program Director's office to see what he might consider playing, and his reaction was that the station could probably "get away with" playing maybe "We've Only Just Begun" and "Superstar" and that was as much time as he was willing to part with that day. Thereafter - nothing until "Make Believe It's Your First Time", as a posthumous release, got a few spins before disappearing into the dustbin of history. Harry, if you "wandered back" into your Program Director's office, to specifically request a Carpenter's tune in tribute to the passing of Karen; you are a true gentleman! Thanks for that added context, Harry. Unfortunate that fitting the trend was more important for the PD than giving listeners an opportunity to remember and appreciate (especially with the backdrop of early 80’s pop - how refreshing would that have been?). I wonder what might have happened (geez, do we use that phrase a lot on this forum...) if RC had held on to all the recordings until decades later, waiting to release them in the late 1990’s, after greater appreciation and reassessment had taken place? One might argue that the posthumous releases, while we fans treasure them, didn’t have a huge impact on the reassessment that eventually took place, and with the momentum of the 1990’s reassessment, news of a “from the vaults” release in the late 1990’s might have been a big deal to the masses (versus the ravenous - in a good way - fan base). ^^That is a very interesting paragraph ! a future re-evaluation/assessment of the duo's entire output ? if not the public at large, would forget the monumental impact the duo had had in the 1970s ! When the duo were finally elevated to that now-expressed "legendary status." "Olivia Newton-John's best album to date." "That's how Rolling Stone described Physical(1981). The magazine's review got it right. Physical would signify the commercial peak of Newton-John's partnership with Farrar." "I noticed when I worked on Physical that Olivia had certain different voices that she could use," says Farrar. I haven’t seen it before so please forgive me if it’s old news! communities and fan cultures worldwide." "THE BLOG 03/14/2013 01:02 pm ET Updated Feb 02, 2016"
"I chose Karen Carpenter for March, and my inbox was full. Full." "Emails upon emails. Requests, memories, and stories; people wanting me to know how much they love Karen Carpenter. And I don’t blame them. I adore Karen Carpenter myself." "Karen Carpenter’s voice isn’t big, or loud, or gymnastic. I don’t know if she would make it on American Idol today. swirl that lives in so much of the sound. And it’s overly optimistic, and “wholesome” in a world that is increasingly less so. "That’s what great art is all about. It’s hard to see the irony in that." Welcome to the forum, Greg! Great insights! At the radio station I worked for, at the time Karen's death was announced, we weren't playing any Carpenters records at all. In 1983, they were a relic of the past and didn't fit with the move-forward attitude of the '80s. The landscape is so much different now in the entertainment world, and the news world is so much more starved for "content." If Karen had died in 2018 instead of when she did, there would have been a lot more attention given. There just wasn't as much "space" to fill back then as there is now. I suspect the 1987 Todd Haynes underground Barbie doll film (and it’s rise to prominance via the internet sharing in the mid-90’s) might have been the turning point. I think your point here has merit. I honestly don't think that ever really happened the way it appears it might have. While people en masse have finally recognized Karen's voice for all that it always was, that's what endures. "If I Were A Carpenter" was far more about Karen's voice than it was about anything else and people reference Karen's voice as a benchmark of perfect female pop singing to this day. Some of the tunes themselves might briefly have become less "guilty pleasure"-esque but that didn't last nearly so long as the appreciation of Karen's voice. not one--not one, mentioned Karen Carpenter's singular, distinctive, one-of-a-kind Voice ! Certainly these articles focused on the hits, Close To You and We've Only just Begun, in particular. 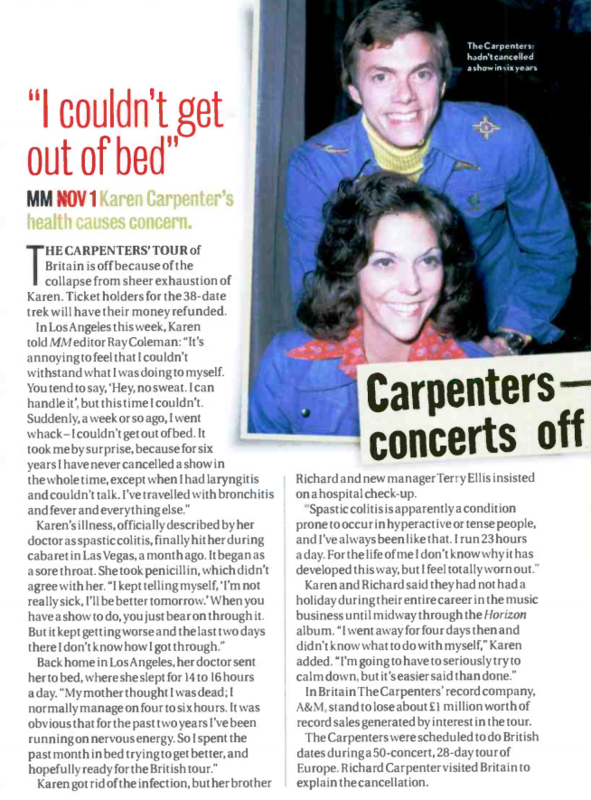 But, a focus upon Karen Carpenter's absolutely stunning vocals....that I did not find at all (in the 1980s). So, I still believe--as I did in the 1980's--that Karen Carpenter, vocally, was woefully underappreciated. Likewise, Carpenters as a duo. --how often would Carpenters' music resonate with the public-at-large ? but, I still do not believe the appreciation is (or ever was) what it should be in general. There are so many singers - even contemporary ones - who reference Karen as an influence. In the 80's, they were quite passé. We know this given how poor their original album sales were - certainly far removed from their glory days. It wasn't really until "If I Were A Carpenter" that the tide began to turn and she could be recognized for how good she really was. "Close to You", "We've Only Just Begun", "Superstar", and "Rainy Days & Mondays" are evergreens that we'll always hear. They've never gone away and likely never will. It's not terribly uncool to admit to liking those tunes, though it is uncool to say you're a Carpenters' fan (for all that matters). Fair point about audience reach for both films, but I never had the sense or recall evidence that the TV biopic made any impact on the artistic reappraisal that took place in the following decade (In fact, I suspect the biopic, with the wigs, etc., might have solidified the “goody four-shoes” image in some ways.). The Todd Haynes’ film, on the other hand, while not initially seen by as many people, was widely discussed (i.e., I read about it long before I had access to it, to your good point...), but the film did reach the influential taste-makers (e.g., in “hip” media outlets, magazines, etc.) who, in turn, do reach mass audiences with their reviews, articles, and book-mentions. In other words, so many of the positive reappraisals note the Haynes film as a watershed moment for viewing the duo’s work through a renewed, rock-credible lens (while most references to the TV biopic are usually added along with continued album sales data to point out ongoing public interest in the duo). "Introducing... 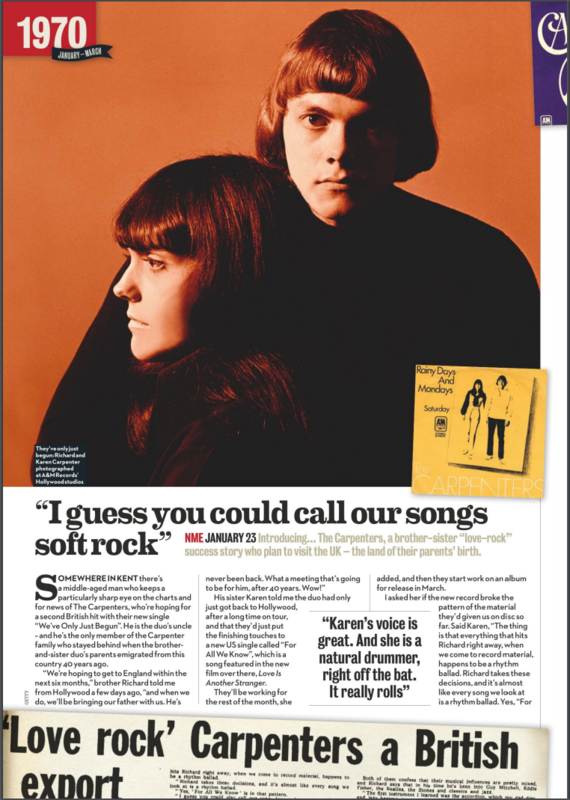 The Carpenters, a brother-sister "love-rock" success story who plan to visit the UK - the land of their parents' birth." I thought Harry was born in China, and Ag was born in Baltimore. "He is the duo's uncle - and the only member of the Carpenter family who stayed behind when the brother-and-sister duo's parents emigrated from this country 40 years ago." Is the article saying they emigrated from the UK around 1930? You correct! Harold's parents were missionaries to China from the UK a century ago. Harold was born in China (or, at least spent a good portion of his childhood there..."shooting magpies" as he once told me). I believe one of his parent's died young, but not sure...I think it was his mother; however, he did survive crossing the North Atlantic during the first world war during the height of the German's targeting civilian ships in that region. Apparently, either his mother or grandmother had an exquisite singing voice; so, the talent, I think, passes down from Dad's side? Agnes was born in Baltimore for sure. Perfect for the holiday season, Carpenters’ ‘Christmas Portrait’ is a timeless record that only gets better with each passing holiday." "While releasing a Christmas album is a time-honored commercial tradition, not all artists are up to the task. Thanks to Richard Carpenter’s studio expertise, an oversized studio orchestra and chorus, terrific arrangements and, most of all, Karen Carpenter’s divine vocals, Christmas Portrait is a timeless album that only gets better with each passing holiday." No.1 Christmas album of that year." "The album went platinum not long after its release and has gone on to become a classic." Consider this: History bears out that all truly great artists are not appreciated in their lifetime. Mozart, Van Gogh, etc. They weren't viewed as artistic geniuses and really appreciated until many years after their deaths. People who are truly ahead of their time and bring that level of excellence to the table aren't recognized for that until the world catches up. With the exception of Japan. They happen to miraculously be behind and ahead of the times at the same time.